This time I wanted to show everyone how to make a very easy, super delicious seafood spectacular! 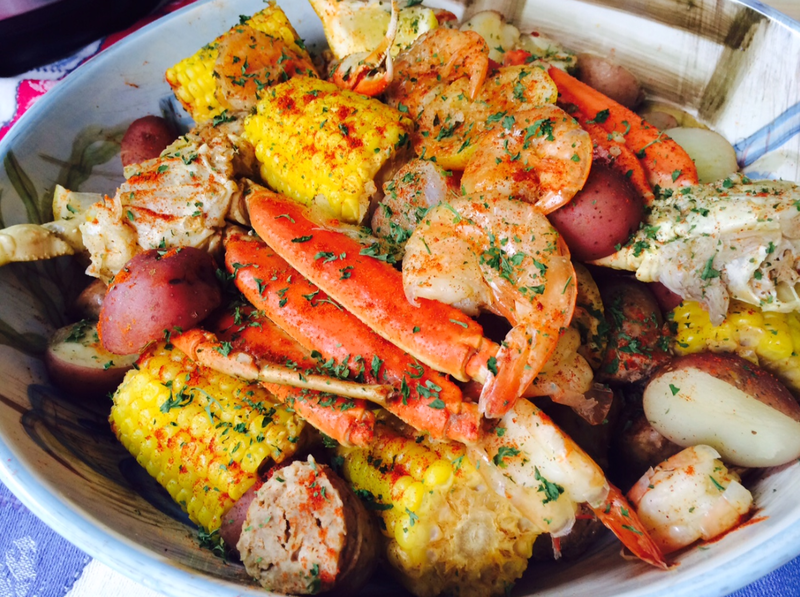 I have put together an amazing Seafood Boil with large to jumbo shrimp, snow crab legs, sweet fennel sausage, sweet corn on the cob and soft red potatoes that are pressure cooked to perfection – Its Amazing !!! I will show you the flavoring process as well as the content layer process from beginning to end using the Instant Pot Pressure Cooker. The amazing recipe, directions, images and full-length video are below !!! It’s excellent for all year round, sporting events(and tailgating), parties, get-together’s, weekend feasts or even during the week because it’s so simple. In this episode, we examine the all of the tasty ingredients that are used in a Southern Style Seafood Boil. I also take you on an amazing fishing experience so we can get our tasty Shrimp and Crabs (our tasty treasures of the sea). We review the flavoring of our seafood boil liquid that includes Zatarains (New Orleans Traditional) Shrimp and Crab boil and the Classic Old Bay Seasonings. I also show you how to make a fantastic flavor sachet; contents include garlic, lemon, sage, bay leaves and thyme wrapped in cheesecloth and submerged in the flavored liquid. We also explore the layering process when adding our red potatoes, corn on the cob, sweet fennel sausage, snow crab legs and large with jumbo shrimp. Gallery from Seafood Boil Video !!! Please note: This is an excellent baseline recipe for everyone. If you like spicier or less spicy foods you may adjust to your liking. The Zatarain’s Shrimp and Crab boil is the spicy ingredient in this recipe, BUT for this recipe, I only use 1 tablespoon so that it is a very mildly spicy boil so that everyone can enjoy. 6 cups water. (You can use the measurement markings on Instant Pot to make the measurement easy for you). 1 tablespoon Zatarain’s shrimp and crab boil concentrate. 1 cheesecloth cut into a large square, and one piece of string or butcher twine to tie the knot. Add all contents to the cheesecloth and tie up with a piece of string or butcher twine (ask in the grocery store). 3 cups, Red Potatoes cleaned and halved. 6 Corn on the Cob (about 4-inch pieces). 6 Sweet Fennel Sausages ( In preparation: pressure cook for 12 minutes in 2 cups of water, remove and cut into 1-inch pieces when cooled off). 1.5 lbs of Snow Crab Clusters (approx. 4-5 clusters)( remove the lower portion of crab leg with kitchen shears so crab leg clusters fit in the pressure cooker, later we will backfill the pressure cooker with the lower portion. 1 to 1.5 lb of Large to Jumbo Shrimp – Cleaned and rinsed/keep shell on (Place the crab and Shrimp in a large bowl as we will be later adding our Hot flavor liquid (like a broth) to it to begin the marinating and soft poaching process. Create our flavor liquid by turning Instant Pot on by pressing the Sauté button. Add to the pot – water, Zatarain’s shrimp and crab boil concentrate, Old Bay seasoning, salt, paprika, flavor sachet, onion quarters and bring to a rolling boil. Layering process begins! ~ Add red potatoes to the liquid and cook for five minutes. PROCESS ALERT!!! After potatoes are added; take a large spoon or ladle and remove about 2-3 cups our flavor liquid from the instant pot and add it to the shrimp and crab in the large bowl so they soak up those flavors. This also allows more room in the Pressure cooker for the solid contents (sausage, corn, crab, and shrimp), bring liquid down to at least the 8 cup mark on the Instant Pot. (See Video). After cooking potatoes for five minutes; add in this order: the sausage, corn on the cob (give a stir), crab leg clusters, shrimp, then the lower portions of the snow crab legs and claws (see video). Apply the pressure cooker lid and lock in place; set the pressure cooker to manual and 5 min, seal the vent on top. After the 5 minutes are up, VENT the pressure cooker and remove the Lid. Please pay attention to time as you do not want to overcook the shrimp and crab! Remove Contents to a large bowl and ladle on some extra Seafood Boil Liquid and serve! Or remove contents to a Traditional Picnic Newspaper spread on a tabletop! And… ~ ENJOY !!! Want the Professional Look?!?!? 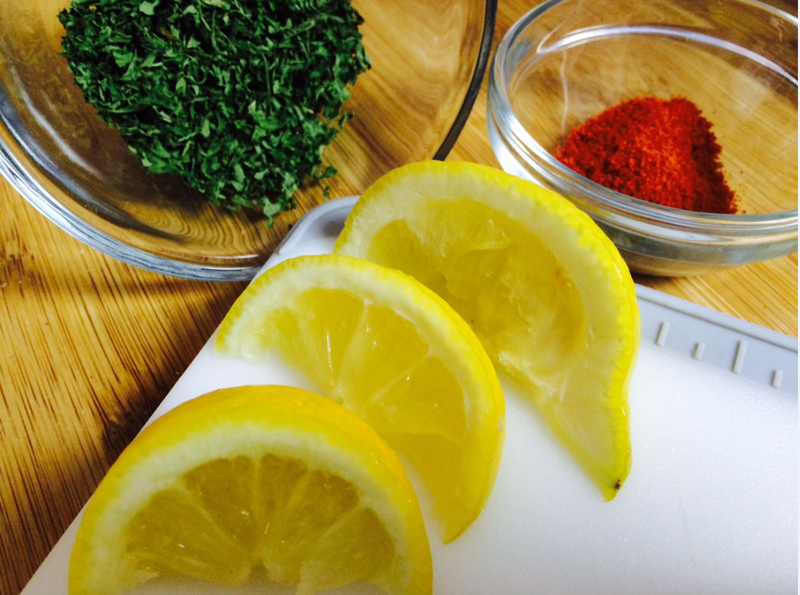 !Before you serve; in this order: add additional lemon wedges then dust with additional Paprika and Dry Parsley, the colors (Red and Green) from these 2 herbs and spices look and taste super amazing on the Seafood Boil! It gives the WOW factor! Don’t forget the onion in the pot, it’s awesome with the sausage! The seafood boil liquid can be used for additional juice or for an additional delicious spicy dip when serving. Serving suggestions: cocktail sauce, tartar sauce, OR my favorite; a Remoulade Sauce (Cajun style mayo, there are different variations of this sauce). I do enjoy garlic bread or Texas toast with this as well. I do hope you make this amazing feast, I believe that this is a tasty recipe for everyone. It’s amazing for all year round, sporting events(and tailgating), parties, get-togethers, weekend feasts or even during the week because it’s so simple. It’s amazing and I’m sure you will love it. Thank you for visiting and I hope you enjoy the video and this blog entry. After you make it for the first time you will be a professional and then you will be able to cook for an army of people since it so fast and easy. Always feel free to leave a comment and let me know how you made out. See you next time for next food adventure! Don’t forget to subscribe! I have so many creative ideas… Don’t miss them! 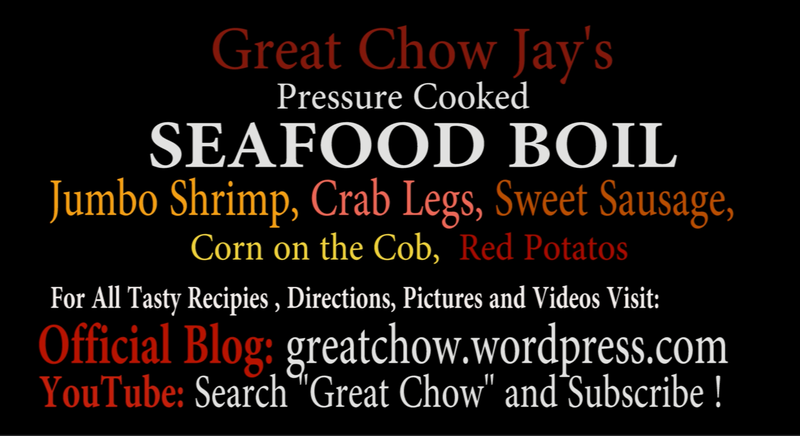 On YouTube – Search “Great Chow” and Subscribe! Instant Pot Pork Marsala – Click HERE!!! Delicious Individual Beef Wellingtons – OMG … They are so Delicious!!! SUSHI and Sushi Rice – The Greatest Homemade Sushi – Click HERE !!! New Release Alert!!! Click HERE Try Great Chow’s Grilled Sausage, Peaches and Onions! Its a Must Try !!! « The Ultimate BBQ Spareribs – Rubbed, Pressure Cooked, Grilled and Glazed !!! Bill !!! Hey Buddy – Thank you – So glad you visited my site/blog and thanks for leaving a message! I know you love fishing, so i knew you find his interesting! haha Awesome! Definitely see you soon my friend! So glad you stopped by ! Hey Richard – Thank you so much! Glad your having fun with the videos , that’s what its all about my friend! Yes Informative, creative, delicious is the formula. I will keep up the work! So… Since the blog and YouTube is relatively new and trending, and I am really trying to develop a plan to make an AMAZING YouTube channel and Blog…Content is key…That said, I do have plans for an fantastic Chicken and Rice episode New York City (NYC) Style (incorporating the pressure cooker)… as well as other kinds of recipes (chicken, meats, soups, pastas etc… for the pressure cooker. There are things happening in the background and self education as well. More videos will launch with my style of making videos : ) Stay tuned Richard, Great to hear from you! BTW – Thanks for the amazing messages on YouTube, I really appreciate it…Make sure you subscribe on YouTube, I don’t want you to miss anything! Love your videos and blog. I am always watching sugar intake due to borderline diabetes. I , and I am sure many others, would truly appreciate your suggestions on sugar substitutes if possible. Cheers! Thank you so much for the message Kevin. I will absolutely keep that in mind as I go along in my videos, I can make some narrations as I actually always have in mind sugar and salt intake. In my personal life I always watch and moderate my consumption of sugar and salts as well. I will definitely keep that in mind as I write up my recipes as well. Thank you again, I’m so glad that you enjoyed the videos and blog. I appreciate the time you take took to write. Don’t forget to subscribe on YouTube, I don’t want you to miss anything! I made this recipe on New Year’s Eve for a group of mostly foodies that love big flavors. It was amazing! Everyone loved it and said they hoped I would make it again. I doubled the amount of the Zatarain’s concentrate and used Andouille rather than the fennel sausage. Your recipe and video were easy to follow and the dish was very easy to make. I believe a key to this dish’s success was layering the ingredients in the PC. Great flavors and a beautiful presentation. Thanks so much for sharing this. Thank you again for your amazing message, its inspiring, your inspiring and It means a lot! Chose this recipe as the first with our new Instant Pot. While we were nervous on our first attempt, the excellent instructions and accompanying video made the effort painless. We did use a nice andouille sausage from our local butcher – next time we will try the fennel sausage. The flavor was amazing and we will be adapting the flavor sachet for other recipes. Next stop – the pulled pork! Hey Jason! WOW – I cant thank you enough for leaving such an awesome comment. I am so happy to see that the Seafood Boil exceeded expectation even on your first Instant Pot attempt. You rocked it! Honestly your message is inspiring, it makes all of the efforts and hours and hours of making the video so worth it. Im glad you used andouille sausage, excellent choice, i love that! Glad you like that flavor sachet ! I thought that was a nice touch! Just so you know if you try my Pulled Pork recipe you can turn the braising liquid into an amazing gravy! Thank you again Jason! Your comment means a lot! I was just wondering for the sage, thyme and bay leaves, how much we should use if we only have the dry versions. For bay leaves I think it’s 1 dry bay leaf if the recipe calls for 2 fresh leaves. I’m not as sure with sage and thyme though, especially if all we have are the crushed/broken up dried sage and thyme. Is it also a 1:2 ratio for those like with bay leaves? Also, we’re planning to use the smaller white potatoes as well as sweet potatoes/yams (orange ones) instead of red potatoes. Should the cook time on those be any different? Lastly, I’m assuming the Zatarain’s “concentrate” referenced in the recipe is the liquid version? I ended up finding some measurements for the dry conversions and we used a coffee filter as a sachet… it didn’t work too well as the sachet ripped open (I think the coffee filter I used was too flimsy – we have stronger ones that I’ve used when making pho and probably should have used one from that bunch instead). The white potatoes were fine but the sweet potatoes completely fell apart. I skinned and cut them into 1″ chunks which was probably too small. I think I had way too many ingredients in the pot as it was overflowing. I had to leave out one cluster of crab and a handful of shrimp (which I just cooked as another batch after). Also, I’m not sure if it was just the quality of the shrimp or if it was way I cleaned the shrimp (I snipped the shell and deveined them) but they came out sort of overcooked. I’m wondering if I should have set the cook time to 3-4 minutes instead of 5. When I ladled the hot broth in for ‘marinating’ the crab/shrimp, I noticed the shrimp seemed to have slightly gotten cooked. Next time I know to use way less ingredients and perhaps try setting the time to 4 minutes or less. Otherwise, it was great! The cooking broth has an excellent flavor. I’m saving it to make rice with! Thank you so much for all of your messages, I enjoyed reading them all. Sorry for the delayed response I have been traveling and it’s been hectic, and I am now trying to get back to everybody. I wish I was available to have answered your questions this past week, but it sounds like you did an amazing job regardless! I am so glad that you gave the seafood boil a try. Its great to hear that you had great success with it. I really enjoyed reading all of your messages. The good thing is once you have made it now you could tell where you should adjust your ingredients, and time settings. Always feel free to adjust the time if you need to. I always say a recipe is just a tasty guideline but you alternately have the choice to calibrate the way that you cook your meal. Yes I could see how that coffee filter was a good idea but it came apart, O’well. Just so you know I did put a link to get some cheesecloth in the recipe from Amazon this way its easy for you to get it. I purposely The shell on the jumbo shrimp so that they would not overcook. If you want you can always set the time a little shorter. Most of the time when I cook the first try is always very interesting as it’s just the first attempt. If you make it again you will know how to make it even better for the next time. It’s all about the experience (now you know what works and what doesn’t work for what you should try for next time). I’m so glad that you visited and thank you so much for trying out the seafood boil, Well Done Jeremy! I’m glad that it had that great seafood boil flavor and saving that juice for some rice is an excellent idea; I may just try that out! All the best Jeremy! Thanks Jason! I really need to get one of those colander scoopers! I think next time I may try setting to a shorter time. With the shrimp though, I did devein them first and used the method where you cut the shell at the top about half way so you can access and pull the vein out. That probably contributed to the slight overcooking. Next time I might just de-shell the shrimp (except for the tails) and throw all the shells into the stock to cook on pressure. Then dump the shelled-shrimp into the broth immediately when it’s done as the residual heat will likely cook the shrimp as well. Sure thing Jeremy! That scooper / colander is awesome, it really works well when trying to get the contents out of the pot while leaving the liquid behind. I love that thing! It sounds like you have a great plan for the next time. The reason I did leave the shell on is so the shrimp is a little more protected. Shrimp do have tenancy to be sensitive when cooked so it looks like you have a method that will work for you; awesome! Its really a great dish, love the ingredient line up! Happy to share it with you! Thanks so much for letting us know how things went, its great to hear from you! Can you use Dungeness crab instead of snow crab? If I was to use the Polska kielbasa by hillshire farm tube things at Walmart, would I still need to pressure cook them for 12 minutes first? Also could one omit crabs and just double the shrimp? Crab and shrimp – frozen or thawed? Does the corn taste “fishy”? This a really amazing recipe and instructions! The video is hilarious when you pull the bag of shrimp out and crab legs , your crazy (in a great way ) ! I love it! Just had to leave a comment! Thank you for this! I can’t wait to try ! i was wondering how many this feeds and how I should adjust to feed 2-4 people. hello . I loved the video. It made things look simple. I was wondering how many people this feeds and how should I adjust to feed 2-4? Thanks for the video Jason. If I use Dungeness crab clusters instead of the crab legs, do you think I should adjust cook time much? I’m using IP.